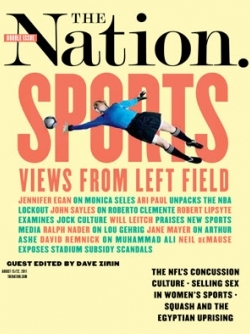 Dave Zirin and Mike Tillery join us to take a look at the most recent issue of The Nation, which focuses on the intersection of sports and politics. Dave Zirin is the host of The Edge of Sports show on XM-Sirius radio. His most recent book is Bad Sports: How Owners are Ruining the Games We Love. Mike Tillery is the writer/founder of the sports blog The Starting Five.